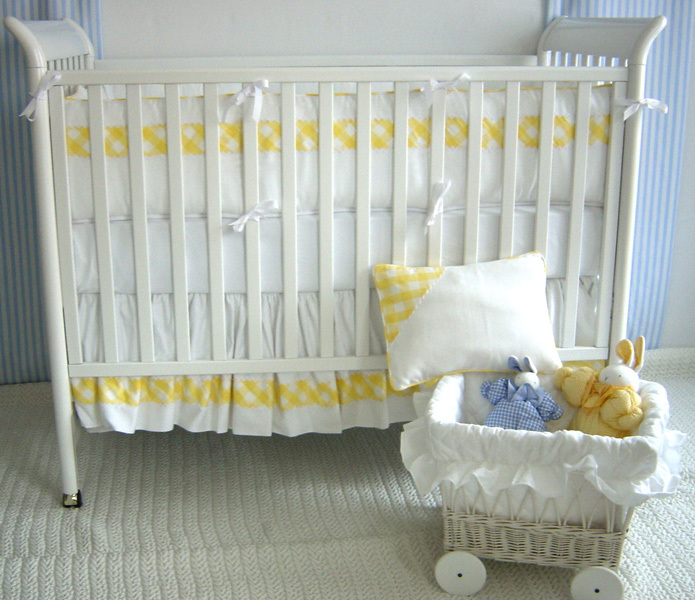 We love these sweet Anastasia linens in warm yellow and white. The bumper is exquisitely tailored with white grosgrain ties finished with piping. Our coverlet is pima pique on one side, flannel on the reverse side, with a ric rac edge. All fabrics are 100% fine cotton. Crib Skirt - 14" Gathered or 22"
(Optional) - Receiving Blanket - 30" x 36"
(Optional) - Coverlet - 36" x 50"
This set is custom made for each customer and cannot be returned. Swatches available upon request, please call 203.655.0185, ext .11 and ask to speak with one of our design consultants. Matching bassinet, toy basket and moses basket available as well as twin bedding as well. Please call for custom options.